Three-wheeled furniture moving dollies provide a convenient means of moving bulky, heavy objects. These 3-wheeled furniture rollers can slide beneath a pool table or sofa, sitting in the tri-dolly's recess, and help you to transport seemingly immovable objects (Source). Some buyers even keep the tri-dollies in place- especially in tool-shops where you can conveniently re-position that 300 lb table saw you occasionally use before rolling it back into the corner. When it comes to lightweight and medium-weight items, the tri-dollies are a cinch to use. For heavier items, to our minds, the best bet is the Mintcraft or the 12" Shepherd Tri-Dolly. Keep in mind, that transitioning between different surface area types, i.e. wood and carpet, can make things a little difficult. And if you're moving something really heavy, there's always a risk that the caster wheels will indent softer, wood floors. You might want to assemble some stripping for the tri-dolly to roll over if you're concerned about ruining your wood floors. Let's take a look at 5 of the best-selling tri dollies for furniture moving. This steel triangle dolly offered by Shepherd Hardware is well-made, durable, sturdy, and convenient for moving furniture. Users love the size and the price of the dolly, but some do note that the wheels are small. The Shepherd steel tri-dolly measures 2” x 6” x 6”, and it features a weight of 7.4 ounces, 1-1/4″ polyolefin wheels with steel bearings, a 1-¼ inch slot with a ½ inch hole, a 2- ¾ inch round base, and a weight load limit of 200 lbs. You can use this steel dolly both inside and outside. A buyer comments that even though the triangle dolly is tiny, it does a fantastic job. He says that he moves his chiminea wherever he wants without worrying about safety and that it’s easy to put or remove the dollies. Another happy user mentions that the steel dolly is perfect for heavy furniture and that he uses it to move his worktable around. He highly recommends it to anyone looking for an inexpensive tri-dolly. A purchaser also adds that the metal looks flimsy, but the dolly holds the weight of his pool table without cracking. However, some customers have complained that the dolly is not suitable for uneven floors or plush carpets and that it’s not easy to move it around. Some users also note that it can’t hold 200 pounds and that the wheels got bent quickly. If you are searching for an inexpensive 3-wheel dolly, you might consider this specialty leg dolly offered by Vestil. Users love the sturdy construction, but some do note that it’s smaller than they expected. The Vestil leg dolly measures 2-1/4” x 6-3/8” x 5-3/4”, and it features a weight of 1.35 pounds, a polyethylene construction, which is resistant to dents and corrosion, and three foam pads on the top to protect the load. The 1-1/4” polyolefin caster wheels are resistant to water and abrasion, and they won’t mar your floors. The dolly has a load limit of 200 lbs, and you can use it in a professional or industrial environment. A purchaser comments that he has been using the moving dolly for about six months and that he is very impressed with its functionality and usefulness. He adds that he used it for very heavy objects and the three-wheel dolly works perfectly on a hard and flat surface. Another reviewer mentions that his saw table remained stable while he was moving it and that even though the dolly is small, it does its job. A buyer also shares that the rolling dolly is still as good as new even with daily use and that the highly recommends it. However, some customers have complained that the tri-wheel dolly doesn’t work very well and that it’s not easy to roll things around. Some users also note that they encountered issues when they used the dolly on carpets or uneven surfaces and that the wheels should be bigger. This 3-wheel furniture dolly offered by Haul Master is handy, reliable, and efficient for moving light furniture. Users love the size and the price of the dolly, but some do note that the wheels are too flimsy. The Haul Master three leg dolly measures 6” x 0.8” x 6”, and it features a weight of one pound, a soft cushioned bottom for better protection, 1-1/2-inch caster wheels, and a depressed center for moving object securely. The load capacity of the mover’s furniture dolly is 132 lbs, and each pack contains four 6-inch dollies. In general, users have a mixed opinion regarding the Haul Master moving dolly, and they agree that the design and the wheels need improvement. A buyer comments that he used the dollies to move a pool table around and that he didn’t have any issues. Another user shares that the dolly is suitable for all kinds of furniture and that he is planning to buy more. He adds that the 3-leg dolly is great for anyone that wants to spare his back. Another customer states that three of the dollies broke while he was moving a bed and that he is very disappointed with the quality of the wheels. Other reviewers also mention that the dolly is not suitable for heavy objects and that it’s useless if your floor isn’t completely flat. The tri-leg moving dolly offered by Mintcraft is expensive, well-made, stable, and suitable for moving heavy furniture. Users love the stable design, but some do note that the wheels are quite small. The Mintcraft tri-dolly measures 23.6” x 13.3” x 16.3”, and it features a weight of 2.2 pounds, an innovative design that facilitates movement, a steel ball bearing construction for better wheel rotation, and 2″ black polyolefin wheels. Overall, this is an excellent choice if you want a high-quality product, but be aware that the package contains only one dolly. A buyer comments that he bought four of these dollies to move a very heavy pool table and that he was very pleased with the result. He adds that he would keep the dollies for future projects. Another happy customer mentions that he moved an 18-inch boat quickly and easy with the help of these moving dollies and that they didn’t bend or crack at all. A reviewer adds that he rolled a 900 lb table over a thick carpet and he didn’t have any issues with the dollies. He highly recommends it as the best 3-leg dollies available. However, some customers have complained that the dolly is too unstable and that the metal is thin. 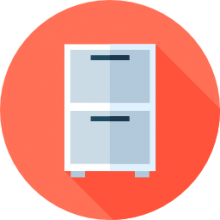 Some users also note that you might have issues if you need to move an object over different surfaces. This 3-legged furniture dolly offered by Haul Master is innovative, handy, and convenient if you want to avoid lifting heavy things. Users love the functionality of the dolly, but some do note that it’s overpriced. The Haul Master tri-dolly measures 8” x 8” x 3”, and it features a weight of 12 ounces, foam rubber grip pads, three ball bearing swivel casters for smooth movements, and pine wood, steel, and polypropylene construction. The weight capacity of the furniture moving dolly is 180 lb, and it’s suitable for your home, shop or garage. In general, buyers have a negative opinion regarding the Haul Master wood tri-dolly, and they agree that the design leaves room for improvement. A customer states that the dolly turned out to be useless for him and that he doesn’t recommend it to anyone who wants to move furniture. Another unhappy reviewer mentions that the three-wheel moving dolly tips very easily and that you can’t transport anything with it. A user also adds that he had problems with the dolly and that it tips even with a light load on it. On the other hand, a happy buyer comments that the tri-legged dolly works exactly as he expected and that it’s useful to have it around if you need to move your furniture regularly. The first three-wheeled furniture dolly we took a look at is the Shepherd Hardware option- it has a 200-pound load capacity and comes in 4-inch, 6-inch, and 12-inch versions. One buyer told us that they were surprised at how tiny these pocket dollies are- saying that there aren't even any wheel bearings. Another professional mover told us that while these are useful for maneuvering wider furniture in and out of apartments, especially on carpet and tile. When it comes to moving heavier wood furniture, especially on wood floors in his experience they have left marks and indentations. In addition, if there are floor separators around door jams and the like, you'll have to lift the furniture up and over them rather than attempting to roll the three wheel dolly over them. Another reviewer writes of having purchased four of these tri dollies and then using them to transport some of his heavier outdoor patio furniture when the seasons changed. He tells us that using this method, he can do a lot of the work himself, rather than enlisting the support of someone else to hoist and heft all of the heavy patio furniture into his storage basement. Another home repair person described having to do a re-flooring job- so he had to move his 600-pound router table into another area of his basement. The furniture rollers helped him transported this incredibly heavy object, and he even left them in place supporting the table, as he redid his floors, eventually moving this and a pool table back in place and freeing them from their rolling casters. 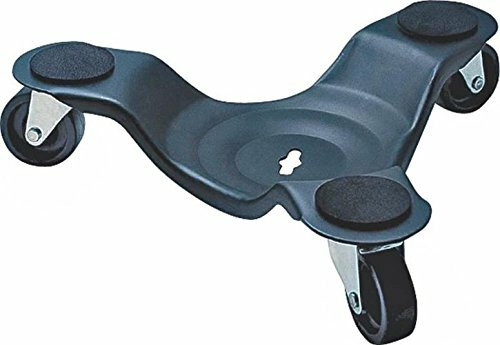 The second option we examined was the Vestil specialty leg dollies- The manufacturer says that these polyethylene furniture rollers employ three swiveling caster wheels ideal for placing beneath overbed table legs, heavy desks and other bulky furniture when you need to move them. Their foam padding protects your heavy, but scratch-prone furniture, for example, from getting marred. In general, they say, that users have employed them to move around heavy machinery, weighty rolls of carpet, cabinets, heavy-duty drum containers and a variety of other weighty and generally immovable objects. One enterprising buyer employs these furniture rollers in his tool shop, situating a heavy table saw and Maytag fridge on these rolling casters, saying that they provide an easy way to store his tools outside when not in use. A gardener, who in the past struggled with incredibly heavy planters loaded with water saturated soil, found that purchasing several packets of these dollies made maneuvering his planters easy, especially when the seasons change. 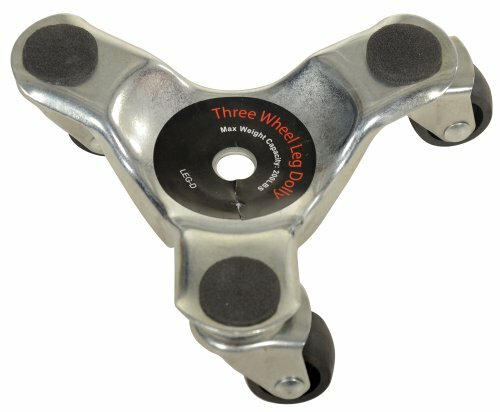 The third pair of three-wheeled furniture dollies we examined is manufactured by Haul Master- these cushioned, caster wheels have a 132-pound load capacity and ship in packs of four. In regards to the load capacity, each dolly has the 132-pound weight capacity, so you would multiply that by four, for instance, if you were applying four of them at a time to move a heavy steel dresser, for example. 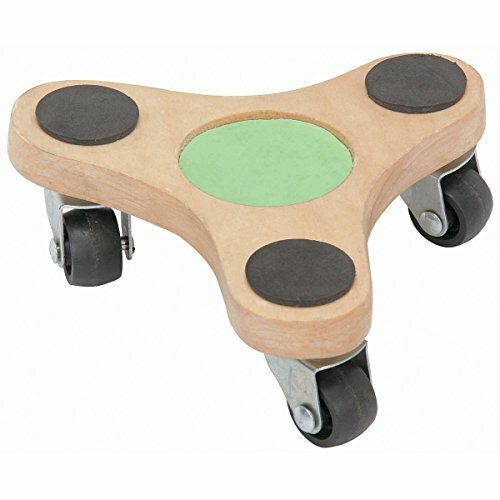 Buyers were unimpressed by these three-wheeled furniture rollers, saying that in their experience they were not useful for transporting heavier objects, especially when the surface they were rolling across was filled with bumps and cracks. As well, if you are moving across different surface areas, for example between a wood floor and a carpeted area, buyers have told us that the dollies have a tendency to fall out of place. The fourth pair of three-wheel furniture dollies we examined is manufactured by Mintcraft- they describe a ball bearing steel construction designed to promote a seamless rotation of their wheels. One reviewer we interviewed told us that since he was too broke to afford to hire movers, so he alone was responsible for moving out of his apartment into a condominium and these three-wheel furniture moving dollies were the only way he was able to do it on his own. While he was satisfied with them, he does say they take a little bit of practice to get comfortable with- he advises novice users to attempt to position your furniture by placing a corner into the recess in the middle of the three casters for added security. As well, moving furniture over heavy carpeting is a struggle and the foam padding does have a tendency to rip off, especially when you are struggling with burdensome and heavy furniture. 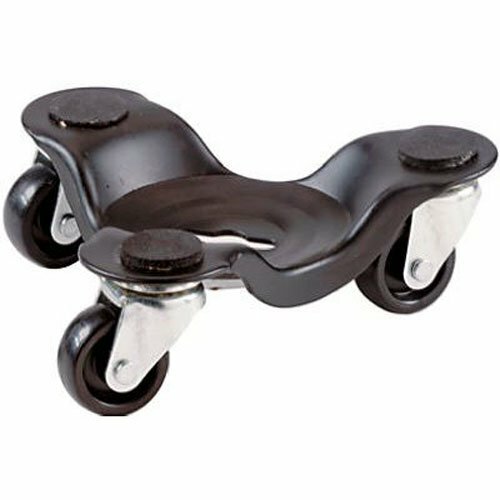 Other buyers echo this reviewer's sentiments, telling us that these are truly heavy-duty furniture rollers ideal for transporting really heavy objects like weightlifting machines, pool tables, and even pianos. One buyer who purchased an incredibly heavy pool table says that he used a hoist lift to slip dollies beneath each leg and a wheelchair ramp and board to roll it out of a U-Haul. Other reviewers commend the design of these three-wheeled, furniture-moving dollies, saying that you can lift heavy furniture into their interior recess without having to heft them over the wheels themselves because the wheels are spaced out enough to accommodate this. The last furniture roller we examined was the Haul Master wooden three-wheeled dolly-it has an 180-pound weight capacity and includes foam grip pads, ball bearing swivel casters and a polypropylene/steel/pinewood construction. Overall, buyers were pretty unimpressed with this furniture moving dolly, saying that they are not well balanced and prone to tipping over. Another reviewer said that because they weren't high enough for what he was looking to move, in fact they were completely useless for his purposes.